Colt Shadovoltaic is an external fixed or moveable photovoltaic solar shading louvre system, designed to reduce heat gains and glare whilst maximising the use of natural daylight, and generating electricity by means of integrated photovoltaic (PV) cells. 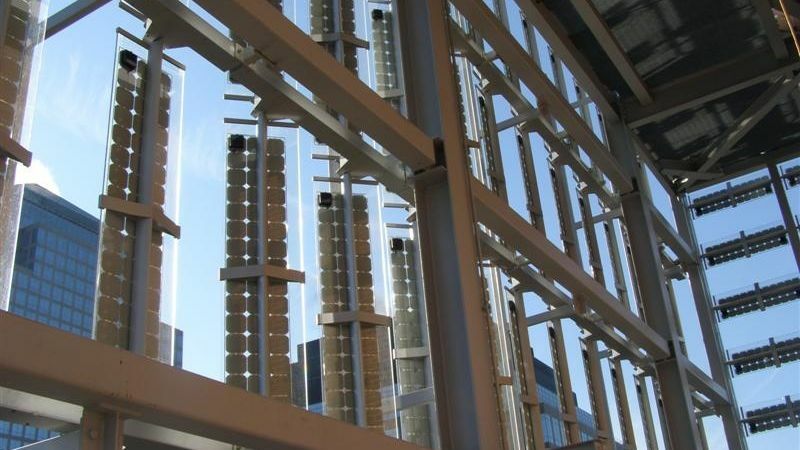 PV cells are integrated into the glass of the shading louvres, either by attaching them to the reverse side of the glass panels or by laminating them between two sheets of glass. Like Shadoglass, Shadovoltaic may be installed either vertically or horizontally in front of the façade or on the roof. It can be either fixed or controllable. 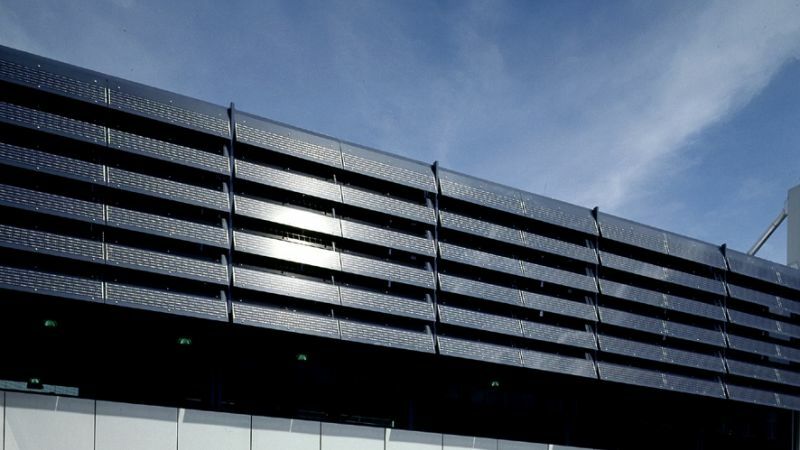 A wide range of louvres – Shadovoltaic louvres are available in various colours, surface finishes and coatings to meet specific design requirements. The type of glass, frit, film or cells can be varied. The louvre spans depends on structural considerations and the kind of louvre blade selected. Click the options tab above to find out more. A wide range of carrier systems – See below. Flexible controls - Shadovoltaic shading systems can be operated by linear actuators that have the capability to operate complete facades. A series of louvres are attached to a system of levers and push rods which link them to a control system. The louvres may be fixed at any angle and can rotate under motorised control within a range of up to 90⁰. Robust - Shadovoltaic is made from high grade aluminium and stainless steel. The system is designed to compensate for thermal expansion. Potential to reduce installation time – Shadovoltaic can be provided in modular pre-assembled form. Various kinds of PV cell can be attached to a Shadovoltaic louvre blade, depending on the specific design requirements. Either 125mm (5”) or 156mm+ (6+”), mono- or poly-crystalline solar cells are available. Either glass-tedlar laminates or glass-glass laminates can be used. Glass panes used are typically fully toughened or heat strengthened dependent upon usage and the applicable national building code. On special request coloured or even semi-transparent solar cells are available. Various surface finishes and coatings can be selected to meet specific design requirements. BIPV (building integrated PV) projects are very often so designed that the green power generated by the PV array is fed into the local grid. In order to ensure that this happens, inverters have to be incorporated together with DC/AC contact breakers and other components. We can advise on this. Shadovoltaic LS-1 is centrally pivoted, intended for wide spans, and incorporates a central aluminium torsion tube incorporating the louvre brackets along the length of the louvre for additional support. Shadovoltaic LS-2 is primarily intended for small spans or where frequent anchor points are available. It provides minimum obstruction to the glass area, thereby maximizing daylight and enhancing the view to the outside. Shadovoltaic LS-3 is centrally pivoted, intended for very wide spans. An aluminium clamping system is fixed along to the short edges of the louvre blades. Shadovoltaic LS-4 is a back hinged system with hidden control mechanisms integrated within the main vertical supports. This enables a seamless continuous appearance when viewed from the outside, since the supports are installed to the back of the louvres. Colt ICS 4-Link or Soltronic are the standard controls for Shadovoltaic. These provide accurate control of the louvre blades, continually calculating the position of the sun and together with internal temperature and lighting sensors controlling the position of the louvres. On dull days, light sensors can operate to fully open the louvres to allow the occupants full vision to the outside at all times. Remote operation is also available via an internal modem interface. Please contact us for more information relating to the application, specification, installation or servicing of Shadovoltaic. Colt Shadovoltaic is an external fixed or moveable photovoltaic louvre solar shading system, designed to reduce heat gains and glare whilst maximising the use of natural daylight, and generating electricity by means of integrated photovoltaic cells. Louvre length: max. 2500 mm. Vertical supports at 2500 mm maximum centres. Louvre length: max. 3300 mm. Vertical supports at 3300 mm maximum centres. Louvre length: max. 3000 mm.